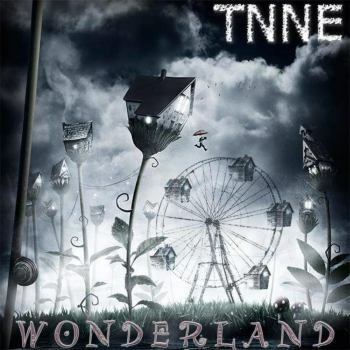 Luxembourg's TNNE returns with their new release Wonderland. A project put together by keyboard-whiz Alex Rukavina and vocalist Patrick Kiefer, joined by drummer Gilles Wagner, bassist Michel Casadei and newly added guitarist Claudio Cordero (Cast) from Chile. Also appearing on the album are saxophonist Fred Hormain and guitarist Cédric Gilis (who appears on tracks 5 and 9). The album opens with My Childish Mind, a well crafted track that bounces back and forth between guitar driven rhythms and piano and synthesizer led themes interspersed with sax leads. When Patrick Kiefer's vocals come in, it is almost unexpected. Eye Of The Storm launches with a driving guitar onslaught from Claudio Cordero. Overall the track feels very much like some of the recent Dream Theater recordings. Katrina Killed the Clown follows and features TNNE's true strengths - the strong voice of Kiefer and the keyboard stylings of Rukavina. While the frenetic guitar/bass/drum attacks continue during the chorus and breaks of this track, it is the piano/voice verses that make this track stand out. The title track, Wonderland, features a much more subdued guitar and some excellent synthesizer doubling and soloing creating one of the best tracks of the disc. Final Fantasy is a track that appears to have a lot of potential, but that ultimately doesn't really go anywhere. Frozen In Time is probably the most “traditionally” prog track on the album which features some top notch playing. Glittering Lights is another top-notch track featuring more guitar and keyboard interplay and another stand-out vocal performance. Eight Weeks is far and away the best track of this disc - moving through a number of different moods and tempos and leaving you wanting more! Le Fils Du Temps is a bonus track which stylistically is quite different - a style I wish they had explored more! An excellent way to close out the disc. Over-all the album features some stand-out performances though the band seems to be at odds with itself trying to find a direction or niche - they move from being an excellent neo-prog band in the vein of IQ or Arena to drifting into the realm of prog-metal without settling into a comfortable style. While fans of neo-prog and prog-metal will really enjoy this album, I find that I have to rate this album a little lower than the performances merit due to the production. The producers have fallen into the “loudness wars” trap of over-compressing the whole performance destroying many of the subtler moments and making it very difficult to listen to this album in its entirety in one sitting - the aural onslaught is tiring and to my ears, ruins what could have been one of the best albums of the year.